First post of 2015 and it’s about three beers released in time for Christmas (there I said it and it’s after the 6th of January). Well the beers in question were brewed by Eight Degrees and make up its Very Imperial Winter 2014/15 collection. Craft beer and the seasonality is becoming bigger in Ireland. It’s as if we eagerly await the launch of spring/summer collections. Eight Degrees followed up 2013’s Back to Black series with three different brews to “tempt and warm you over the cooler season”. 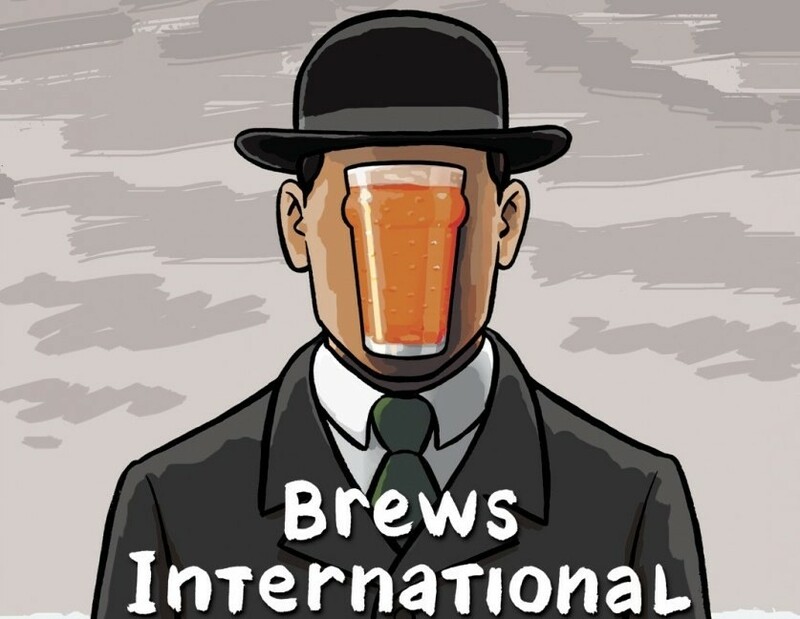 There’s Double Irish, a double IPA (so not just a clever name at 9.0% abv, Belgian Dubbel at 7.2% abv and finally the survivor from the previous year, Russian Imperial Stout at 9% abv. I had tried these beers after their release in the fourth week of November but things were so manic since then, I’m only getting time to post about them now. 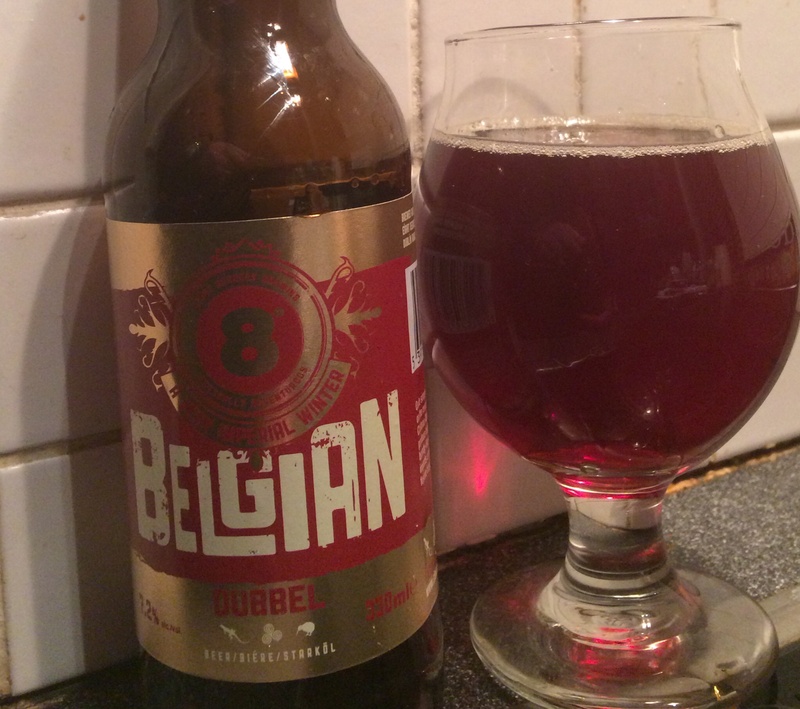 I had even used the dubbel in a tasting the day after they appeared in the shops for the first time to a group who’d been lucky enough to sample it in Mitchelstown before its release. A dubbel is a great food beer and it’s perfect for roast dinners so it was good to be able to use and Irish version for a tasting. 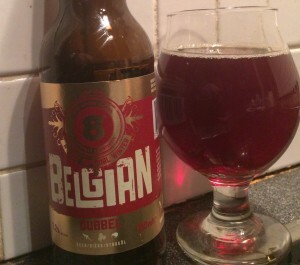 The Belgian Dubbel pours with colour similarities to Rodenbach. It has a distinctly bright reddish-brown appearance and certainly more vibrant than more characteristic dubbels out there. It’s also extremely clear and given the right glass, it could pass for a brandy (the head dissipates quickly). There’s banana and dark fruits, mainly plums on the nose. On tasting, there’s some initial carbonation but quickly disappears. In terms of flavour profile, there’s a hit of plums and a dash of spice up front before being taken over by sweet notes that continue into the finish. 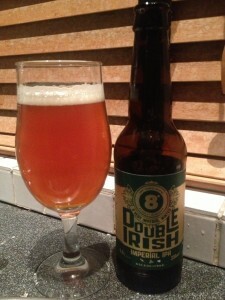 Earlier this year, Eight Degrees released Full Irish, a single malt IPA at 6% abv. It was packed full of big citrus flavours with a malt bill that wasn’t going to get in the way. 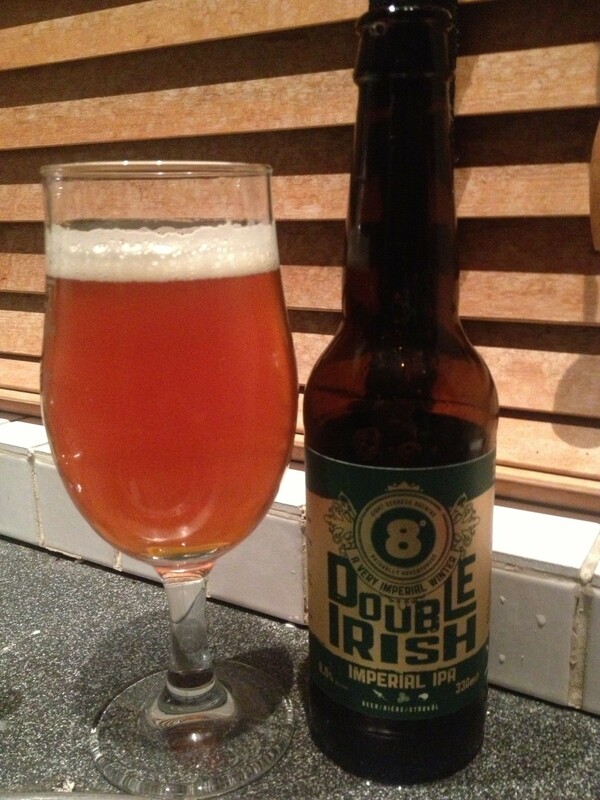 Double Irish is this beer’s big brother. It pours a rich bronze colour with a hazy amber hue. The aroma is a total immersion in tropical sweet fruits. There’s a tangy freshness of orange and pineapple. Sticky fruit on taste, with some caramel before yielding to a pure and chewy dry finish. At 9% abv, there’s a warming bitterness on the finish that’s similar to a strepsil in its warming sensation on the throat. 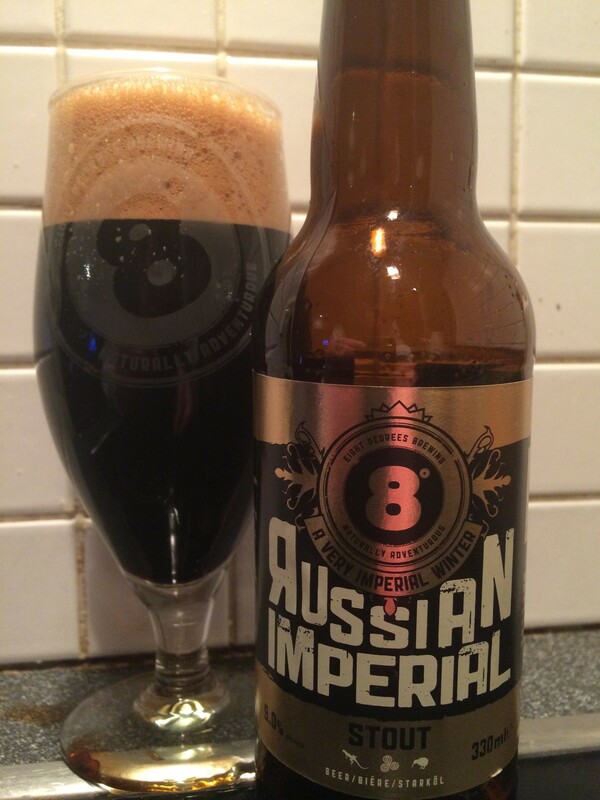 The final beer is the Russian Imperial Stout. The previous year’s version featured as my choice for the desert beer for my 2013 Christmas Dinner Menu. It pours jet black, with a thick creamy caramel head (perhaps reminiscent of a coke float). It has plenty of vanilla and chocolate notes on the nose. On first taste, you can pick out sweet vanilla, bourbon and espresso characteristics. While it continually hints at its alcohol strength, the beer takes on a bitter, dark roasted espresso finish. While these beers may not be standard-bearers for a given style in their own right, they achieve what Scott and Cam set out to do, namely to be winter sippers. What’s even more remarkable is that they all come in around the €3 euro mark. The brewery has had remarkable success over the past five years but they have consistently been able to maintain the prices at the lower end. Big things can be expected to come from them in 2015 as they expand production. A second-hand kit, with funding secured via Linked Finance, is on its way from Mauritius. Hopefully we’ll see some of the seasonal and once-off beers released in 2014 becoming regularly available. The brewery even featured this week on the first broadcast of UTV Ireland’s Ireland Live at 10 programme.